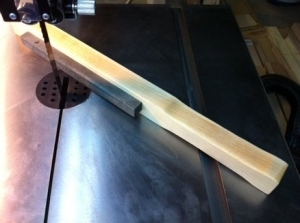 Homemade tool intended to round the back edge of bandsaw blades, resulting in an improved finish for the workpiece. Consists of a piece of silicon carbide hot-glued to a mortise in the maple handle. Finished with boiled linseed oil. Didn't know that that detail would help improve the finish of the cut. Learned something new!